Some types of cancers are very difficult to treat. Cancer that has spread to the lining surfaces of the peritoneal (abdominal) cavity from primary colorectal cancer, ovarian cancer, gastric cancer, appendiceal cancer or from mesothelioma and pseudomyxoma peritonei--known as peritoneal carcinomatosis--are such cancers. Despite numerous recent advances in chemotherapy, the overall chance of chemotherapy being curative is still low, and the side effects are difficult for the patient to endure. However, when these cancers are confined to the peritoneal cavity, Hyperthermic Intraperitoneal Chemotherapy (HIPEC) becomes an option for candidate patients. Before HIPEC is administered, the surgeon--using standard surgical methods--will remove all visible tumors that can be removed throughout the peritoneal cavity. This is known as cytoreductive surgery. Following cytoreductive surgery, in the operative setting the surgeon will administer HIPEC treatment. 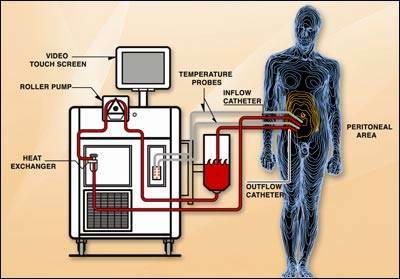 During the HIPEC procedure, the surgeon will continuously circulate a heated sterile solution--containing a chemotherapeutic agent--throughout the peritoneal cavity, for a maximum of two hours. The HIPEC procedure is designed to attempt to kill any remaining cancer cells. The procedure also improves drug absorption and effect with minimal exposure to the rest of the body. In this way, the normal side effects of chemotherapy can be avoided.